KABUL, Afghanistan _ When President Obama took the stage at Cairo University on June 4, his goal in part was to change how the Muslim world perceives the United States and launch "a new beginning" in relations between Islam and the West. But it will take more than words to convince Afghans that the American president is committed to improving their lives. As least not as long as this deeply disappointed and alienated population struggle to survive amid declining security and a rising insurgence. "I cannot remember when a speech changed people's lives," said Mohammad Hanif, a resident of Kabul. "I listened to all of it, but it was for the Americans and their interests. We Afghans are just onlookers. There will not be any benefit for us there." Abdullah, a student at Kabul University who like many Afghans goes by only one name, said that he still finds it hard to trust Obama, "We ... understand ...that all the leaders of the world say one thing and do something else. So I am not expecting Obama to do what he said," he said. 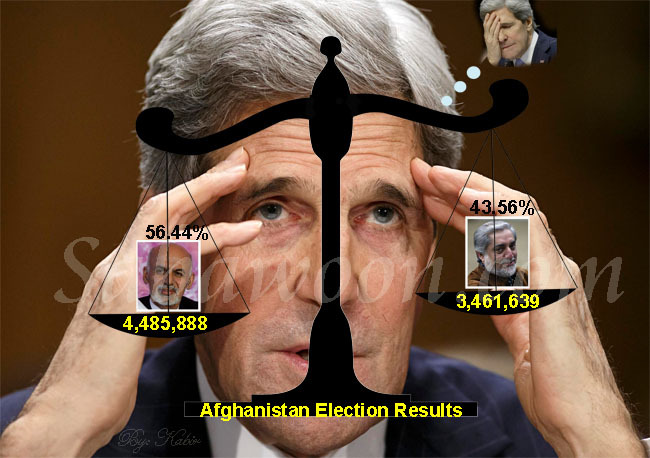 Afghans have, in general, responded positively to the young American president, and most believe that his attitude toward the Muslim world is a sharp and welcome departure from that of his predecessor, George W. Bush. But Afghans have been waiting for positive signs of change since the U.S.-led invasion in 2001, and they are growing impatient. Afghans are especially skeptical of Obama's words regarding America's long-range objectives in the region. "Make no mistake: we do not want to keep our troops in Afghanistan," the president said in Cairo. "We seek no military bases there. It is agonizing for America to lose our young men and women. It is costly and politically difficult to continue this conflict. "We would gladly bring every single one of our troops home if we could be confident that there were not violent extremists in Afghanistan and Pakistan determined to kill as many Americans as they possibly can. But that is not yet the case." But with no end to the insurgency in sight and more American troops on the way, what Afghans actually see is the United States moving to consolidate its position in their country. "With the (security) situation getting more complicated by the day, no one believes that the Americans will leave Afghanistan," said journalist and political analyst Daad Noorani Alim Mushfiq, chief editor of Nawai Kuhsar, a weekly in northern Afghanistan, noted that while the U.S. president acknowledged a military solution alone was not the answer to Afghanistan's problems, he was nonetheless planning to increase his forces here. "Regarding conflicts in Afghanistan and Pakistan, and Islamic fundamentalists in both countries, his speech had a big paradox as he mentioned that military power cannot resolve the problem of two countries, but practically we are seeing that he is sending extra troops in Afghanistan," Mushfiq said. "It seems that still there is a big space between U.S. politicians' speeches and acts." Indeed, there is a common perception in Afghanistan that the United States is pursuing an overarching goal in the region and using the conflict with the Taliban to establish and justify an armed presence there. Others worried that Obama's speech signaled that the United States may be adopting a new policy towards the radical groups that are waging the increasingly active insurgency in Afghanistan and Pakistan. "What I understood from Obama's speech is that Americans have run out of patience," said Hashmatullah Ahmadzai, a political analyst in Mazar- e-Sharif. "They can no longer tolerate this headache. They are now trying to reconcile with flexible Islamic groups, and the efforts to negotiate with the moderate Taliban in Afghanistan could be a good example of this." The issue of negotiations with the Taliban is a contentious and divisive one within Afghanistan. While some recommend trying to separate the moderate Taliban from the extremists, others argue that no accommodation to the Taliban worldview is possible. Despite their deep skepticism, most Afghans welcomed the general tone of Obama's address as a breath of fresh air. "We have completely forgotten morality in diplomacy over the past few decades," said political analyst Mahmoud Sayeqal "Obama's speech represents a return to moral issues. For example, when he said that he would say what was in his heart." Mohammd Latif, a Kabul resident, agreed: "Obama's speech ... was hopeful. Now in our country the problem is that the insurgents think America is against Islam, but his speech showed that, if the (former U.S. administration) had some bad policy towards Islamic countries, now Obama wants to be close with them and wants to change U.S. relations with Islamic countries." Obama's reference to the Koran went down well in Helmand province, the center of the Taliban insurgency. Abdul Wali Raheb, a resident of Helmand's capital, Lashkar Gah, said that the speech changed his attitude towards the United States in general. "Obama talked about Islam, he cited the Holy Koran. He said that if you kill one person, it's as if you kill all humanity. This is really appreciated. I think Obama is a real humanitarian," he said. Sayed Yaqub Ibrahimi is a reporter in Afghanistan who writes for The Institute for War & Peace Reporting, a nonprofit organization that trains journalists in areas of conflict. Readers may write to the author at the Institute for War & Peace Reporting, 48 Grays Inn Road, London WC1X 8LT, U.K.; Web site: www.iwpr.net. For information about IWPR's funding, please go to http://www.iwpr.net/index.pl?top_supporters.html.